2017 Spectrum CAD Model - "Gamma Ray"
Our main sheet metal order for our robot has been sent over to our wonderful sponsor Solarcraft Inc. So that means are robot CAD is nearly complete. It's still missing a few details but largely the mechanisms are complete and assembled in CAD. 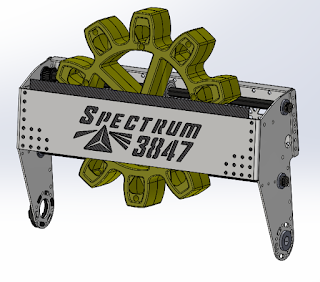 We are releasing all of our CAD this year every week and this week we are even uploading a STEP file so you can view our robot model in any CAD package that you choose. Full Solidworks Models can be found on our website. Our gear intake subsystem showed the most improvement over the weekend. It's a simple solution to a complex problem. The main concept is a thin material slides under the edge of the gear and then a roller brings the gear in to place. We are using a BAG motor with a Versaplanetary to power the roller and another BAG motor and Versaplanetary to raise and lower the entire mechanism. This mechanism folds down between the bumper gap that is open for our Fuel intake. 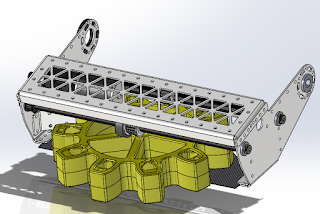 Our mecanum intake will allow us to gather far more balls then just using the intake between our bumper gap and also lets us gather balls that may be directly against the wall. We are raising and lowering the intake using pneumatics but we also have two gas springs on the mechanism so if we ever lose air pressure during the match our intake will default to the up position. This should allow us to continue scoring gears the more important game pieces even if we have a pneumatics leak. Let us know if you have any questions or suggestions. We are sharing our progress to hopefully inspire more teams but we also would love feedback. If you see something we are doing and think we can improve please let us know. Looks great, thanks for sharing and good luck!